His Lordship and I are off to a wedding this afternoon. I made a card weeks back and put it in a safe place. Big mistake. The safe place is so safe that neither of us can find it (I expect Kye the cat knows exactly where it is, sleeps in it regularly and is laughing at the frantic search). No matter. I bought a few card kits for this reason. Well, usually lack of organisation, not loss of organisation. I chose a cream and gold topper and a cream, embossed card blank from the Kanban Decadent Delights collection, stamped a load of Dreamees flowers and pretty twiddly bits in gold on cream paper and set the Scan’N’Cut to cut them out as I showered ready for the wedding. 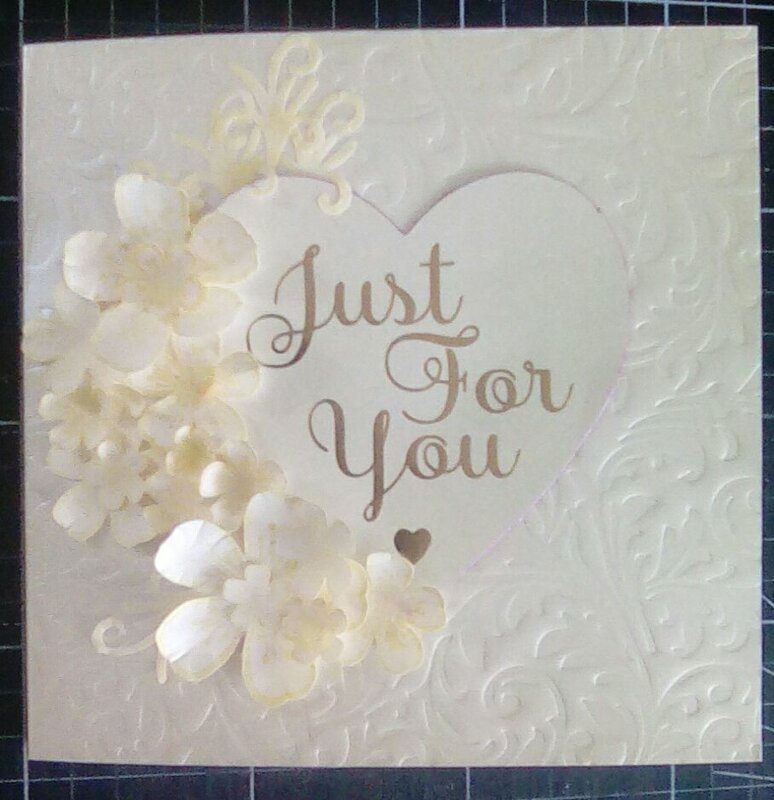 At first I intended to use some of the beautiful cream,embossed card with gold foiling in the collection, but once I laid out my card ingredients it didn’t need anything extra and I think would have been too much. The only thing I did for added interest was ink the edge of the heart topper with a pinky purply ink. I shaped my flowers using an embossing tool and foam mat. After sticking the heart topper slightly right of central on my card blank, I peeped 4 of the pretty twiddly bits out of the top of the heart and layered lots of flowers down the left of the heart. Et voila. Pretty, I think, and appropriate for a wedding, and took about 10 minutes to put together. Then writing thius post has let my nails dry, off to get dressed now. This entry was posted in cards, craft on April 29, 2017 by Isn't She Crafty. My friend trained in drama, although she acts little nowadays as she’s busy doing the grown up thing of working and paying rent and trying to find a work/life balance. She remains a very confident, dramatic person who is definitely not a shrinking violet. She loves colour and she’s a proper magpie. I wanted a fairly classy look to her card, but to have it make an impact, nod to her personality. Also, she’s turning a certain age which deserves acknowledgment. The layout is based on a card I saw on Pinterest, I liked the simple design because I thought I could then really enjoy playing with the details and make them much bigger – not necessarily in size, but in impact – than if I went for a more fussy design. The numbers are cut from Create and Craft’s sequined sequin card again, three different designs. 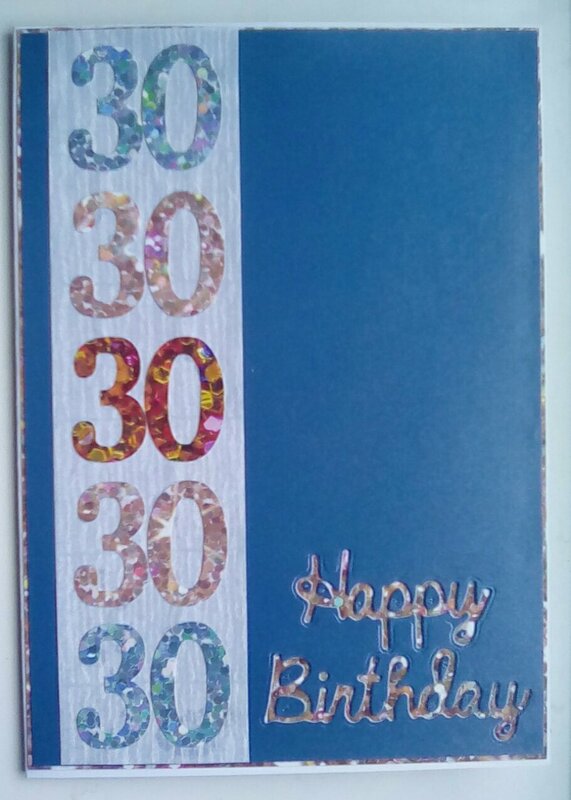 I love how blingy and wow the card is (although I’m not brave enough to use it in large quantities) and I thought it would be a great way to satisfy my friend’s magpie. I wanted 5 numbers, and having them all in the same design seemed a bit boring, the odd number meant I had to choose between three of one and two of another, or two twos and a one which was what I went for for maximum going. I wish I could get photos to show off just how shiny this sequined sequin card is, but I can’t despite trying natural light, torches and funny angles. If anyone has any tips they’d be very much appreciated. I wanted something very subtle to lay the super shiny numbers against, and found this lovely white slightly striped vellum in the stash I inherited. It seemed a good background because the contrast of textures really drew my eye, hopefully it does the same for others. The background had to be a very simple one. This is not something I find easy to do, and I had to tell myself not to emboss it or add gems or any extra. I did choose a pearlescent finish, it’s Adorable Scorable but I don’t know what colour as I got it in a mixed pack. 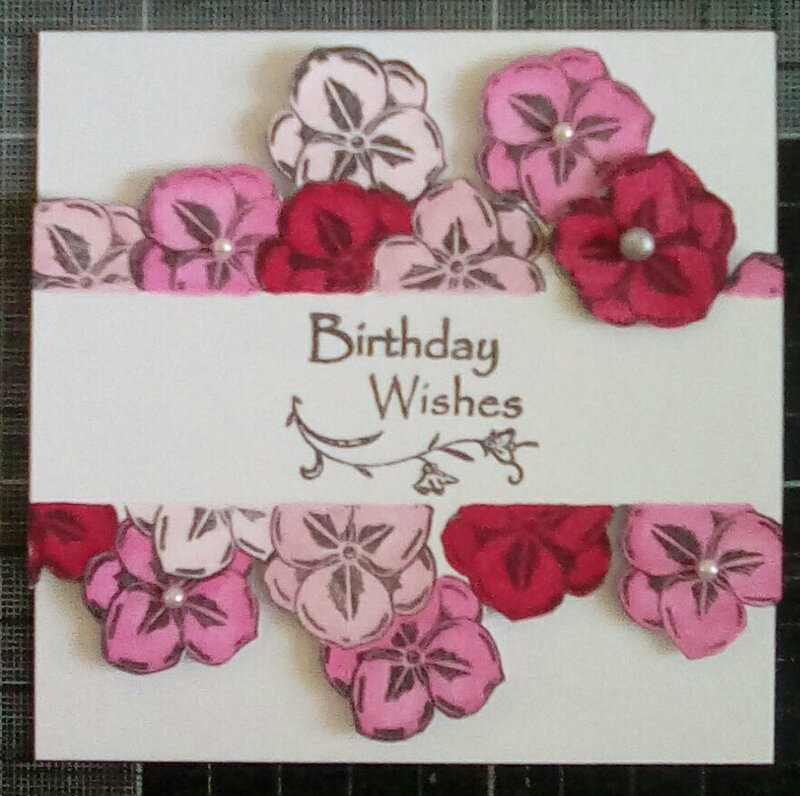 At first I die cut Happy Birthday and put it onto the front of the card, but it looked a little bland and I was finding it hard to choose the right colour to use (so I now have 7 different pre cut greetings for future cards). Inspiration struck: I thought I could use the negative and have whichever card I chose for my backing layer show through. This led to further deliberation. What to use for the backing layer? I considered silver mirri card, but it was too harsh and too in your face as well as meaning the card seemed to have too much going on, but iut did make me realise the card needed more shininess. Hmmm. I spent ages trying the card against different card until I realised I was giving myself a much harder task than I needed, by using some of the sequined sequin card again I could pull all my colours together and really let the magpie go wild. Overall I am really pleased with this card, it’s very much outside of my comfort zone (I love clean and simple designs when I see other people’s makes, but return struggle not to add extras to my own as they tend to feel boring or bland) but I am confident my friend will like it. This entry was posted in cards, craft on April 12, 2017 by Isn't She Crafty. 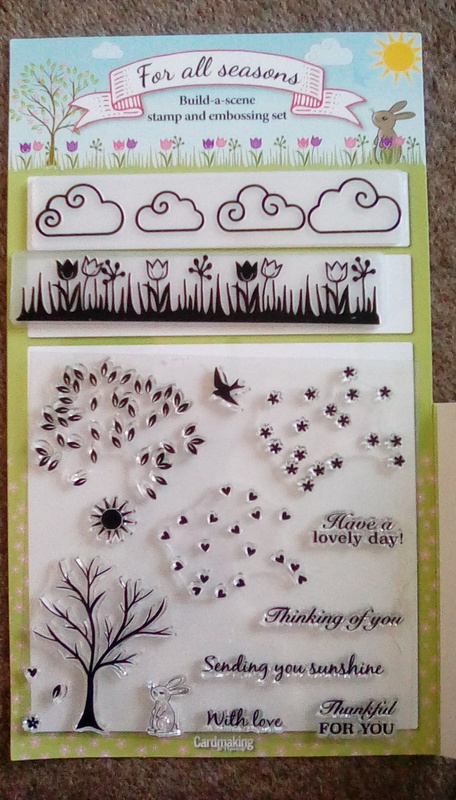 Inspired by the many stamped cards and projects with masking that I have seen recently, I decided to get out a magazine freebie which doesn’t get the use it should and have an experiment. 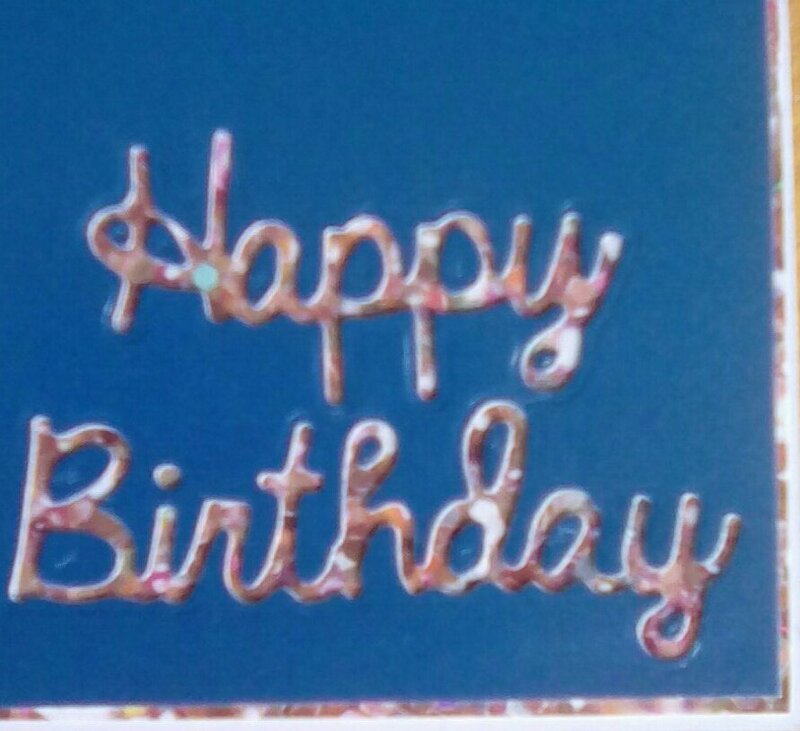 I measured the ‘Happy Birthday’ sentiment, and cut a piece of card as wide as the piece of card I was working on (122x173mm, to fit a 7×5 card blank) and as deep as the sentiment. I used masking tape to attach the card strip across my project, fixing it to the back – I’ve had too many oops moments when the tape hasn’t been as low tack as I thought and the front has had bits pulled off. The pansy (I think, I’m not good with flowers) was stamped once on to my project, ensuring it overlapped the edge of my project and the masking strip. I then realised I needed a mask of the actual flower, so I stamped it onto a post-it and fussy cut it out. I covered indicate flowers on my project as I moved across. I actually found this fairly easy, and was surprised at how effective the layered up pansies look. Once I had covered my project in two rough rows of flowers, I chose 3 Spectrum Noir pens and coloured my flowers. Only once everything was coloured did I remove the masking strip and I was thrilled with it. I stamped the sentiment in the middle of the white area. One of my flowers was smudged and even when colored was obviously wrong, so I stamped, coloured and fussy cut one flower, covering the oops one. I thought it looked effective standing proud of the others, the only one to overlap the sentiment blank area. Unfortunately, I was concentrating so much on the flowers that I didn’t notice I’d got ink on my finger and was making lovely black marks across the bottom and sides of my project! 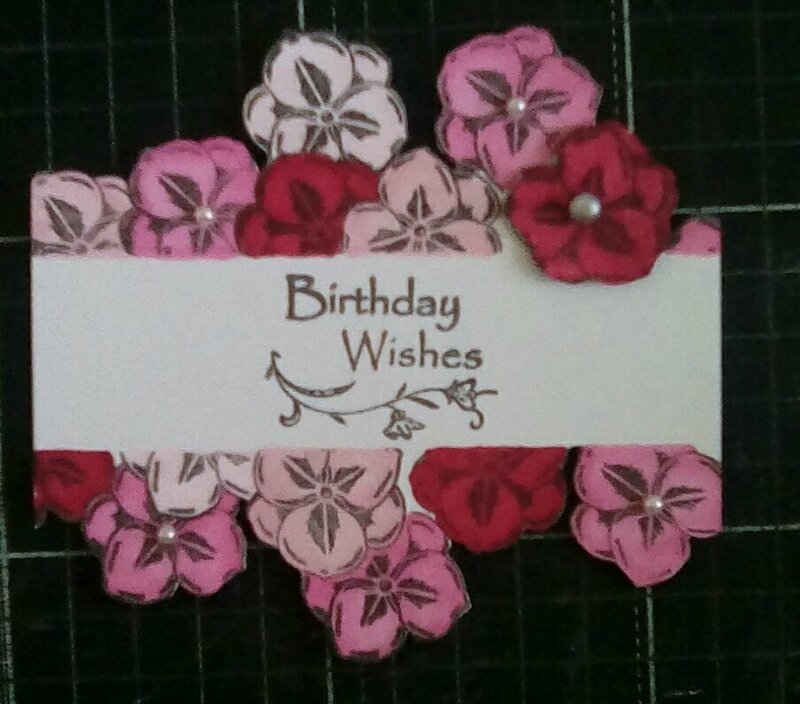 I was pleased enough with the general look that I wanted to use it, so I trimmed off the edges which were badly marked, ending up with a much smaller topper, then I fussy cut the outside of the flower panel. This was then layered onto a square of white card using 3d foam pads for depth. I haven’t yet finished the card, but I am really pleased with my first attempt at a new technique. I think I’m going to stamp up a load of toppers and then I can have a day of assembling cards when mojo is low again. ​Thank you to Happy Ink Designs for telling me about her friend’s NBUS challenge (Never Been Used Schtuff). I am entering my card into this month’s challenge. 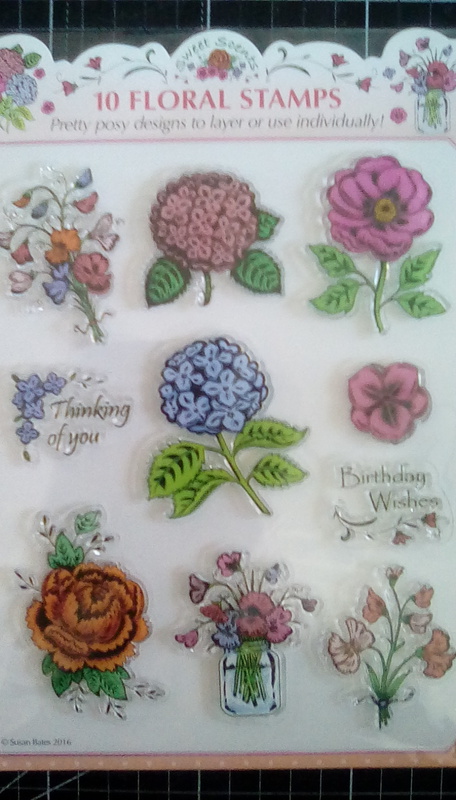 This entry was posted in cards, craft on April 10, 2017 by Isn't She Crafty. My crafty mojo has been somewhat lacking over the past week, I know making things helps my mood but if it’s low it can be very hard to get the oomph together to get started. 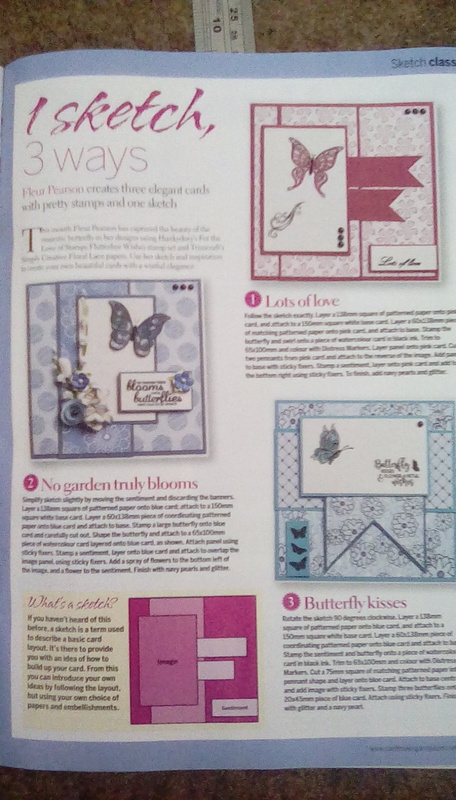 My copy of issue 169 of Cardmaking and Papercraft dropped onto the doormat this morning, complete with beautiful free stamps and embossing folders. The stamps are build a scene in style with a tree and various decoration (for want of a better word), something I’ve seen similar versions of previously and liked the look of, but never been able to justify the cost. and I thought it lent itself really well to the tree stamp set. There was also a section on advice using vellum; I inherited a lot but used it very little, so thought I’d dig some out for the banners on the sketch. The sylvan feel of the stamps made me think of my Tonic Studios Woodland Walk paper stack, so I spent ages going through stash to find it, very pleased I did as it gives exactly the effect I was after. I used my Load and Fold to get a nice crisp image of the tree. I have found that when I have layering stamps I can still use the Load and Fold; I lay the stamp face down but uninked where I want it on my image, fold the stamping platform down onto the flat, sticky side of the stamp and it’s in the perfect position to then ink and stamp where I wanted it. 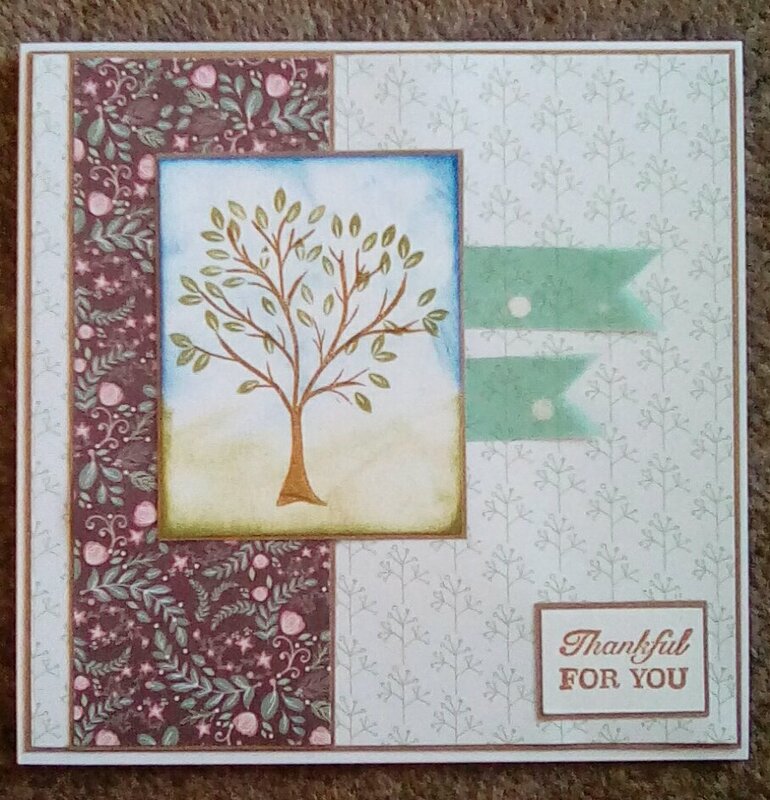 Once I had the tree stamped, I cut my piece of card to size. I prefer doing it this way round so that if I am not as accurate as I thought with placing the stamp I can still centre the image. I used a blue and a green ink to create a background by ‘kissing’ the paper very gently with the ink pads, focusing on the edges. The nature theme seemed to need Kraft card, so all my matting and layering was with this. I tried to keep the colours simple and in keeping with the woodland/nature theme, and I really liked the teeny trees on the paper I chose for the background. The sentiment was from the free stamps, too. I have had a lot of support over the past week from my husband, my mother in law and sister in law as well as my best friend (my own mother iis lovely but practical and her stance is it’s happened, happens to a lot of people, mpove on), and I’ve got thank you style cards to make and send, so this felt ideal. Now I’m looking at the finished card I actually feel that it’s hopeful and potentially symbolic of new beginnings, actually very fitting to send to someone who supported me through miscarriage. This entry was posted in cards, craft on April 8, 2017 by Isn't She Crafty.